Raccoons Rags: Knitting pattern for Kaye Wiggs dolls. Knitting pattern for Kaye Wiggs dolls. Whew. I'm a busy, busy bee. This has been hinted at in previous posts, but I play my cards close to my chest, just in case I fail miserably at something. But! I'm happy to announce my very first in what will hopefully be a new line of knitting patterns. The first one is for Kaye Wiggs 43cm girls. I couldn't find a really basic sweater when surfing around for dolly sewing patterns, so I've created my own. Price without VAT is £5.99. Etsy will charge EU customers VAT (This does not affect America or other non-EU countries). I always recommend people to look in my Craftsy store anyway, as the prices fluctuate, due to the international exchange rates. I always recommend comparing prices. Here's the tale. Before I ever dreamed of starting to sew for dolls, back in my teens and twenties, I was a knitwear designer. I've always been able to knit my own jumpers and hats and bits and pieces. I also crochet ... competently. Thus far though, I've felt intimidated by the tiny fiddly scale of dolly knitting and crochet. Recently, I've been drooling over some of the doll knitwear on Pinterest, and for slightly larger dolls such as Kaye Wiggs (and yes, Ellowyne fans, she too) knitting seemed a bit less daunting. So I picked up some yarn from my stash and started faffing around with something for Ell. It was far too big for her! But, it did almost fit my Gracie. So I re-knitted, and came up with my first sweater, then I made a cardigan, then I bought some new yarn.... and long story short. I'm hooked. That's totally not a pun, this is knitting, not crochet. Although I'm not ruling out crochet in the future. The knitting patterns take longer to develop than the sewing ones, especially as I only knit at weekends, but hopefully my new page on this blog will slowly fill with pretty things for people knit for their dollies. Okay, you've sussed me. Any excuse to photograph Gracie. I must get her more of these acrylic eyes I like them even more than the glass ones. So that's that for now. I have a big bag of new yarn bursting to have something else made from it. I think Ellowyne is looking neglected, so she's next! And now I really can take the rest of my weekend off. Sorta. I'm dying to knit some more. What an exciting new challenge :-). Your first models look great! I love knitting for myself and for my dolls, too :-). Very nice... yes knitting and crochet is much easier for the bigger dolls and the nice thing is once you've got a basic pattern that's a good fit you can mix it up with cables or lace or even just a textured stitch. I've already got more yarn than I can possibly use in a lifetime but it doesn't stop me buying more!! Ooh Gracie you've got the same wig as Kiki Patience - just fab!! I think the scale works better too, on the slightly larger dolls. But I di have two large packages of gorgeous laceweight yarn. So maybe I can make something nice for Patience too. I do love taking a basic pattern and playing around with it! It's lovely. But seems hard to find in variegated shades in the UK, and even then it's SO expensive compared to regular DK or 4 ply. I made a blankie from acrylic DK many years ago, I wish I still had it. But yes, bargains. My downfall, lol! I have a large stash of hand dyed laceweight - most of 100g skeins - the plan has always been to knit a shawl and then use the rest for the girls.... somehow the shawls never seem to get made!!! Have you seen Malabrigo Lace Weight Yarn - that has some variegated shades - they have some on the WoolWarehouse site (I love them - fab service!) - still not cheap but a little does go a very long way!!! Yummy. yes, I have DK balls stashed away to knit myself hats, but i'm ALWAYS making stuff for the dolls! Oh yes, I've seen Malabrigo on Ebay, but thatnks for the tip, I've just looked up Woolwarehouse (I nearly typed woolwhorehouse...) and they do have lots of yarns. Must not buy... lol. If it goes a long way for the money, that's good. I was just worried i'd need like 3 £16 balls for one doll sweater, or something. I've made at least 3 tops/dresses from one of my laceweight skeins and it's hardly put a dent in it!! If you want even more yarns to look at there's also loveknitting - they send stuff very quickly as well... not that I'm trying to tempt you into buying more!! Oh wow, that sounds good. I've found Loveknitting and bought some stuff from them. They are very fast, but I see some of the yarns at woolwharehouse are a bit cheaper. SSP-045: Sewing pattern for Kaye Wiggs dolls. 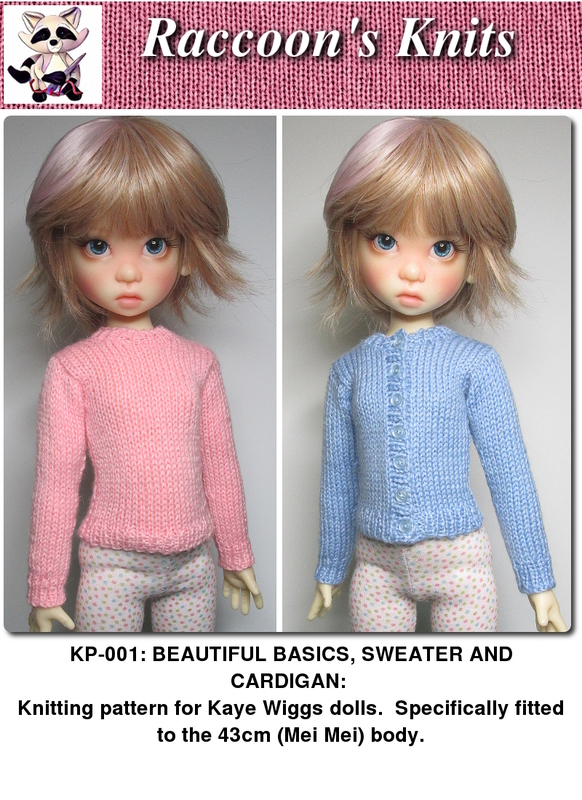 Candy sweater outfit for Kaye Wiggs dolls. SSP-044: New sewing pattern for Kaye Wiggs dolls.